Millions of people watched Cosmos—indeed, until Ken Burns' Civil War series appeared a decade later it was the most-viewed show in PBS history, and if you count worldwide viewers it may still be the most-viewed of all. Among the viewers was a man in Covington, Louisiana who almost certainly watched it with a glass of bourbon in his hand. This man, whose name was Walker Percy, was a doctor of medicine but instead of practicing that art had become a writer. He was deeply interested in the manifold varieties of human oddity, preferring perhaps the farcical to the tragic—or at any rate he was inclined to see the farcical within the tragic. For this reason, and because as a writer he kept irregular hours, he also liked to watch the Phil Donahue Show, the first of the tabloid talk shows that later became ubiquitous on American daytime TV. It occurred to Walker Percy that a strange, twisted thread linked Carl Sagan's "personal voyage" through the Cosmos and the bizarre array of bruised and weird people who showed up so regularly on Donahue's set. Thirty years ago he published the book in which he traced that thread. 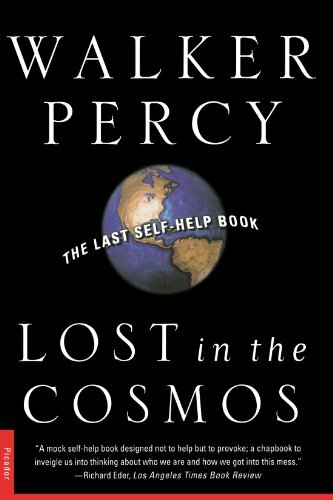 It is called Lost in the Cosmos: the Last Self-Help Book, and it may as well have been written yesterday. It is a curious and affecting way of pursuing philosophical and theological questions: to burst into story, as characters in Broadway musicals burst into song. Percy is one of the few who have taken Kierkegaard as a model in this respect. Lost in the Cosmos is stuffed with mini-stories, cast in the form of "thought experiments" which conclude with questions for the reader. There is the soldier of the future who may or may not be able to see the Parthenon; the "ex-suicide" who goes to work because he doesn't have to; the several observers of a corn dance at a Taos Indian pueblo; the physicist ("You write about the Cosmos") whose friend and neighbor is also a popularizing scientist—but a more successful one. These stories culminate in questions because Lost in the Cosmos is (so its subtitle informs us) "The Last Self-Help Book," and takes the form of a "Twenty-Question Multiple-Choice Self-Help Quiz to test your knowledge of the peculiar status of the self, your self and other selves, in the Cosmos, and your knowledge of what to do with your self in these, the last years of the twentieth century"—the sort of quiz you might take while thumbing through an issue of Reader's Digest or Ladies' Home Journal or Psychology Today, but afflicted with a comic gigantism, inflated wildly and parodically to 250 pages. Question 20 ("The Self Marooned in the Cosmos")—which, in the spirit of the thing, naturally becomes three questions—is embedded in 40 pages of narrative about a handful of survivors on a blasted post-nuclear-holocaust Earth. Among the other narratives, one of the longest and most provocative is part of Question 8 ("The Promiscuous Self") and is called "The Last Donahue Show." It is the last Donahue show because Phil's conversation with and about a pregnant 14-year-old named Penny—"I want to have my baby. I think babies are neat"—is interrupted by the sudden arrival on the set of three uninvited strangers, two of whom have inexplicably traveled through time while the third has (rather more explicably) traveled from distant space. One visitor is a Confederate colonel named John Pelham. The second is John Calvin—yes, that John Calvin. And the third is an unnamed representative of an advanced alien civilization who has come to announce the imminent nuclear destruction of all, or almost all, life on Earth. The human species is now undertaking a great venture that if successful will be as important as the colonization of the land or the descent from the trees. We are haltingly, tentatively breaking the shackles of Earth—metaphorically, in confronting and taming the admonitions of those more primitive brains within us; physically, in voyaging to the planets and listening for the messages from the stars. These two enterprises are linked indissolubly.